The kitchen is one of the most important rooms in a home. It is a place for gathering with family and friends to enjoy great meals. In order to create great meals, one must have a kitchen that they love. Kitchen worktops are an important component to help one reach this goal. Kitchen worktops provide a space for one to chop food, put together recipes, and more. The counter must be strong and durable, as well as attractive. There are many different options that meet this criteria. Popular materials include woods, granite, and stainless steel. Wood varies greatly, so one has even more choices. Several types of woods are suitable for use in the kitchen, including oak, maple, cherry, walnut, teak, and mahogany. Hardwoods are good options for durability. The price of the wood will depend on the type, thickness, and retailer that sells it. Wood is a sanitary choice, which is important for a kitchen counter top. However, one will need to maintain the wood to keep it durable and prevent damage. This is especially necessary if the wood is near or around a sink area, where it can get damp and moldy. Granite is popular, as it has a variety of colors and patterns. It is available worldwide, and each piece is unique. It can be costly, with thicker pieces being more expensive. Tiles are available for those on a tighter budget. A granite worktop may need to be treated for durability, as some pieces can be quite porous. 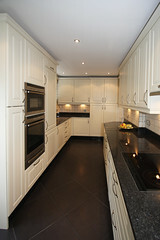 Stainless steel worktops match with many modern kitchen appliances. Even if one does not have stainless appliances, the silver color is suitable for most environments. It is stain resistant, perfect for a kitchen. It can also be treated to get rid of scratches that might occur. There are many kitchen worktops for one to choose from to help create their perfect kitchen.